Slam the door on pen and paper scheduling, open the windows, and bask in the glorious future of window and door software. If you’re swamped by office waste and employee confusion, it’s time to breathe the fresh air of Smart Service, the best window and door installation service software around! Add the best service scheduler on the market and your business will be set for years to come. If you’ve been in the window and door business for any decent length of time, you’re probably already managing a good deal of your business with QuickBooks. If this is the case, the idea of adding more window and door installation software might seem daunting. Fortunately, Smart Service is a QuickBooks add-on. You’re not so much adding new software as you are bolstering what you’ve already got in place! Learn more. 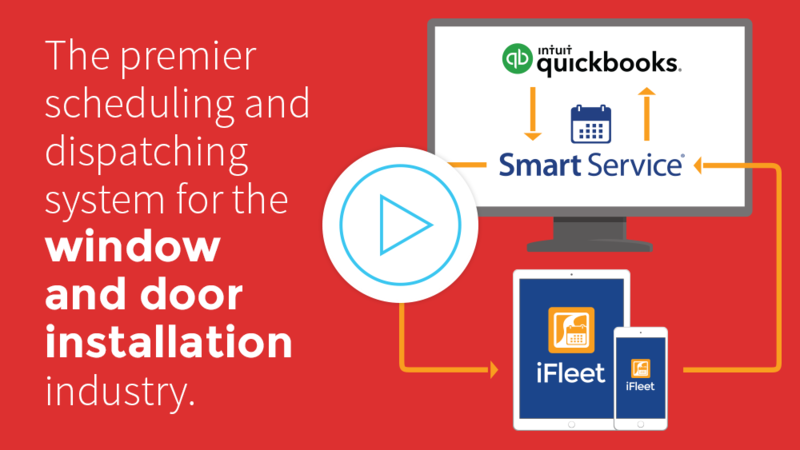 Smart Service partners with QuickBooks, but what does it do once it’s there? The simple answer: everything! This window and door repair software lets you schedule jobs for the customers already in your QuickBooks database, schedule new jobs for new customers, dispatch those jobs to your employees’ mobile devices, and create invoices for finished work in record time. Learn more. When it’s time to send a serviceman or crew out into the world, you typically give them a clipboard and hope for the best. If things go right, this is all they need. If things don’t go right, work stops and the phone calls start. “Where do I go next?” “What am I doing here again?” Do these questions sound familiar? If so, it’s time to give iFleet a try. This mobile window and door app puts histories, contact information, schedules, and more onto employees’ mobile devices. iFleet works seamlessly with Smart Service, making the pairing a perfect window and door software solution! Learn more. The list of successful service companies using Smart Service is about as long as any list you’ll ever see. Take a look at stories from some of our proudest customers.